76 MMS January 2017 mmsonline.com FEATURE enabled 3+2 machining. This eliminated the need for manual setup adjustments to provide spindle access to multiple part faces. However, he says that machine's rotary table, spindle housing and other components left no room for larger parts like mold bases and base plates, particularly when mounted on pallet stacks. The model in place now, Grob's G350, suffers no such restrictions, offering the ability to accommodate blocks even larger than the 18-by-18-by-3-inch plates for the largest, standard quick-change frames. With an auto-opening door, a feature requested by Omega and incorporated by Grob, the machine can also be integrated with the robot. That's a contrast with previous models that required human oper- ators to swap pallets in and out of the table chuck. The machine's spacious workzone is thanks largely to its horizontal spindle, which retracts back into the enclosure (including for toolchanges), as well as its one-sided trunnion table, which can flip a full 180 degrees. These two features allow the shop to machine mold base waterlines as deep as 22 inches by drilling to half depth, then flipping the part to bore the rest of the hole from the other side, Mr. Arbic says. Along with carefully p r o g r a m m e d 3 +2 m a c h i n i n g r o u t i n e s , t h i s c o nf i g u rati o n a l s o m a ke s c o m p l ex fe atu re s more accessible than ever before, he adds. That facilitates the use of shor ter, more rigid tool assemblies to achieve tighter tolerances and smoother f inishes. T he machines' 202-tool- capacity automatic toolchanger (ATC) also prevents tool availability or breakage from limiting lights-out capacit y. 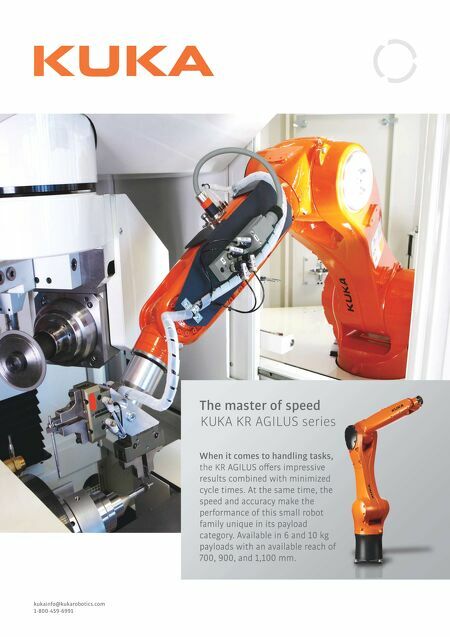 He adds that the combination of a 26,000-rpm, HSK63A spindle and 63 Nm of torque provide versatility for both heavy material removal and fine finishing operations. 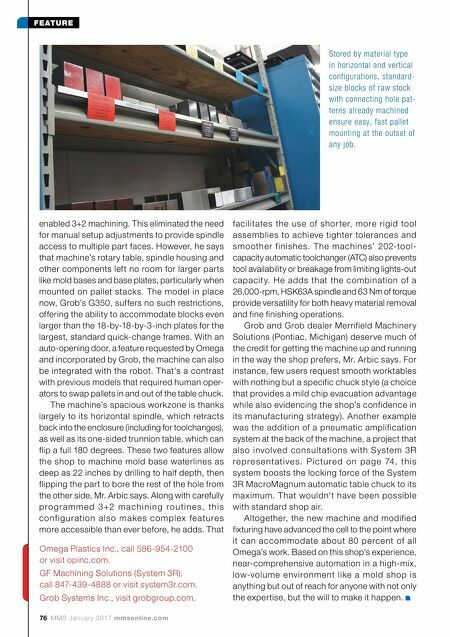 Grob and Grob dealer Merrifield Machinery Solutions (Pontiac, Michigan) deserve much of the credit for getting the machine up and running in the way the shop prefers, Mr. Arbic says. For instance, few users request smooth worktables with nothing but a specific chuck style (a choice that provides a mild chip evacuation advantage while also evidencing the shop's confidence in its manufacturing strategy). Another example was the addition of a pneumatic amplification system at the back of the machine, a project that also involve d consultations with S yste m 3R r e p r e s e n t a t i ve s . P i c t u r e d o n p a g e 74, t h i s system boosts the locking force of the System 3R MacroMagnum automatic table chuck to its ma ximum. That wouldn't have been possible with standard shop air. Altogether, the new machine and modified fixturing have advanced the cell to the point where it can accommodate about 80 percent of all Omega's work. Based on this shop's experience, near-comprehensive automation in a high-mix, low-volume environment like a mold shop is anything but out of reach for anyone with not only the expertise, but the will to make it happen. Stored by material type in horizontal and vertical configurations, standard- size blocks of raw stock with connecting hole pat- terns already machined ensure easy, fast pallet mounting at the outset of any job. Omega Plastics Inc., call 586-954-2100 or visit opinc.com. GF Machining Solutions (System 3R), call 847-439-4888 or visit system3r.com. Grob Systems Inc., visit grobgroup.com.